Well….today’s post was supposed to be about these Heavenly Tres Leches Cupcakes I spotted at SophistiMom.com on Friday and knew I had to make immediately! (It is my favorite cake…bar none.) But you know…the best laid plans…and all that. I guess this experience will teach me to read all the way to the end of the recipe before I start making it. lol. CREAMY WHITE CHICKEN ARTICHOKE LASAGNA! I know it has absolutely nothing to do with Tres Leches Cupcakes…but I have noticed over the last couple of days that it has been spreading like wildfire on Pinterest. I saw it online about a week ago (maybe longer) and decided to pin it to one of my boards because I thought it looked delicious! 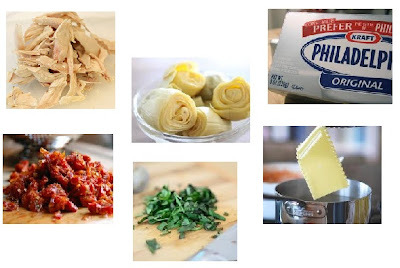 I mean come on…Creamy White Sauce….Chicken….Artichokes….Lasagna!!! I’m craving it right now just thinking about it…and I am not in the least bit hungry! Since I pinned it to my board…it has been repinned over 51,000 times! And that’s just from MY pin. I can’t imagine how many times it has been repinned from the people that repinned it from me! lol. It gets a little confusing….but suffice it to say….people are in love with this recipe! Stephanie………..This was delish! It will definitely be made again and again! Jeni …… Made this tonight and it was awesome! I added spinach and green onions on top. Yum! Parthena……..I made this last night and it was amazing!! Great recipe! sandra……….. This is absolutely delicious! Combine chicken, artichokes, tomatoes, 1 cup mozzarella and Parmesan. blended; stir in 2 Tbsp. basil. Mix half with the chicken mixture. with remaining cheese sauce and mozzarella; cover. Bake 25 min. or until heated through. Sprinkle with remaining basil. I can tell you right now…I will be making this SOON as well…..right after I have my Tres Leches Cupcakes FOR BREAKFAST! Yippee!!! Stir in 2 Tbsp. basil. Mix half with the chicken mixture. Top with remaining cheese sauce and mozzarella; cover. Make Your Own Chewy Granola Bars. THE Perfect Snack! This was gross. This isn’t the original Pintrest recipe. We tried it thinking it was and it was a total flop. WOW This looks so cheesy and delicious!! Made this last night for dinner for me and my boyfriend and we LOVED it!!! I even made my mom come over and get a piece for her lunch today and she said it was out of this world! Can’t wait to have the leftovers for dinner tonight. Thanks for sharing such a great recipe. Will be making this again!! LOVE, LOVE, LOVE this recipe. My 5yr inhales it for dinner. I’m 4wks away from having my second child and trying to make meals ahead. I’m not much of a cook so I’m asking for help. Should I bake it then freeze or make it, freeze it and then bake (and do I just defrost it in the fridge before baking) Thanks for the help. You could probably do either. It might taste better if you make, freeze, then bake. And yes, just defrost in your fridge. I LOVE this recipe!! It has been a huge hit with my entire family. One modification I made was to use roasted red peppers instead of sun dried tomatoes. Delicious!! I think I may use a little extra cheeses, too! I made this tonight. It was ok. I left out the artichokes heart. It was just too creamy. What I will do different is use 1 pkg of cream cheese and add ricotta cheese and instead of sun dried tomatoes use diced tomatoes. I made this a few months ago, with a few tweaks. I substituted half of the cream cheese for a jar of Alfredo sauce, and added spinach… BEST EVER. Its a favorite here. I probably put in almost double the mozzarella also. You way sounds delish! I am going to make it with your changes when I try it – which I am hoping will be this weekend!